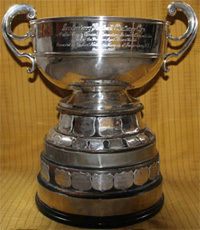 The Londonderry Cup, for Under 15s, is the most prestigious and oldest of all senior schools' cups in Durham County. It was established in 1907 and all profits are in aid of the Durham Aged Mineworkers Association. The following report of the first Londonderry Cup Final was found in the Durham County Advertiser for Friday 8 May 1908. "The Marquis of Londonderry's Challenge Cup, presented for competition amongst County Council Elementary Schools in the rural districts of the County of Durham in aid of the Durham Aged Mineworkers Homes Association was won on Saturday at West Stanley by the Perkinsville boys who beat Springwell boys by 2 goals to 1 goal. There was a big crowd, the gate receipts amounting to about £30." The following description of the medals, the first winners received, was reported in the Durham Chronicle of Friday 19 June 1908. "The medals are of solid gold and of handsome design, each being in a separate velvet-lined leather case, and bearing in the centre shield, the initials of the boy who won it." Above is the medal that was presented to James Lowe, a member of the winning Chopwell side, in 1936. The medal was hallmarked 9ct gold.